Debilitating illness is an equal-opportunity defeater. Not even bewigged kings bedecked in fancy threads are immune to the power of a mysterious crippling disease — such as the the blood-born chronic disorder that attacked the nervous system of King George III. 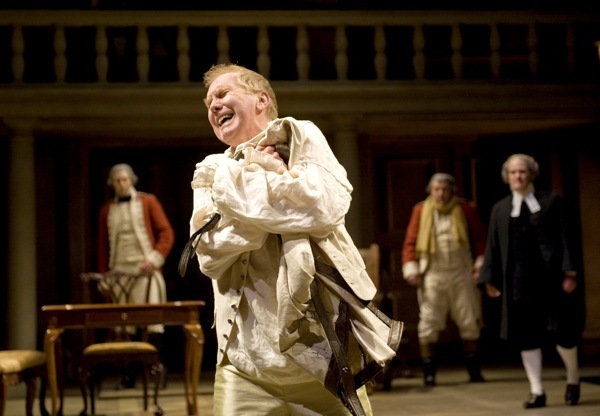 Still smarting from the loss of American colonies in the Revolutionary War, George III, as imagined by Alan Bennett in his 1991 play, The Madness of George III, is struggling to remain control of the government while his body begins to shut down due to an unknown ailment. He quickly descends into babbling hysteria, while his queen (Ora Jones) helplessly looks on as a cracker-jack team of puzzled doctors pull every known — and unknown — medical trick out of their bags. Meanwhile, the pompous Prince of Wales salivates over the prospect of the throne, doing everything in his power to have his father declared mad. But one particular doctor (an ex-minister named Dr. Willis, played with unwavering intensity by James Newcomb) does not give up hope on the poor king, and uses a very unorthodox treatment regimen — which is saying something for 18th century treatment regimens — to cure the man. Chicago Shakespeare Theater’s immensely entertaining production of Bennett’s fiercely intelligent play (which he adapted into the 1994 Academy Award-winning film, The Madness of King George) benefits from one of the most satisfying leading man performances I’ve seen in some time. Harry Groener’s a king fit for the ages. Full of pomp and circumstance, but incredibly human, Groener’s transformation from warm but firm leader to a diapered, confused old man is shocking and convincing. “I’ve always been myself, even when I was ill. Rightfully so, Groener — whom I’ve known of primary from his Tony-nominated musical theatre turns in Crazy for You and Cats, of all things — received an enthusiastic standing ovation last night. His performance is the reason to see this show. The rest of the production, ably directed by Penny Metropulos, is strong, if a little hammy and uneven at times. Scenes involving the Prince of Wales (a petulantly plump Richard Baird) and the Duke of York (a flouncy Alex Weisman, giving the term “sycophant” new meaning) are entertaining, if a little cartoonish. Broad strokes threaten to overpower Groener’s finely tuned performance. More problematic is Jones, who’s simply miscast in the pivotal role of Queen Charlotte. Not only does she seem to struggle with a vaguely German accent, but Jones doesn’t seem like the type of gal who’d be so easily removed from her king during his time of need simply due to doctor’s orders. While the queen is certainly a fiery, determined woman, she’s also quite vulnerable, and that half of the role wasn’t believable for me. But Jones throws herself into the role as best she can, and her final moments with “Mr. King,” as she lovingly refers to him, are touching. But, overall, the show’s two hour, 45 minute running time races by, and you realize that you’ve seen one royal winner of a performance from Mr. Groener.